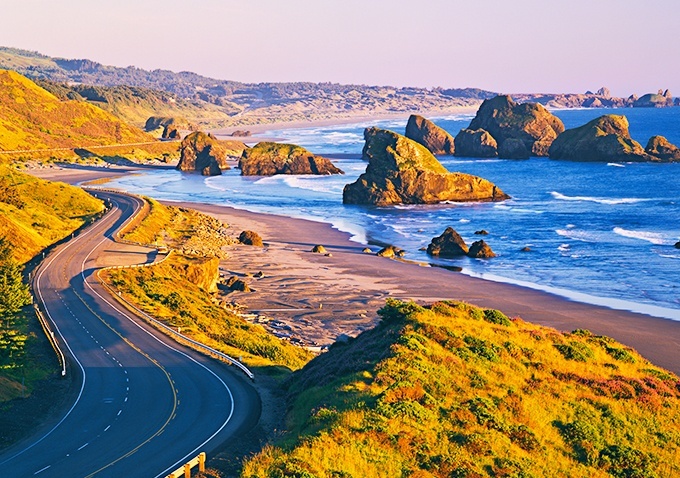 Give yourself the gift of experiencing amazing natural beauty with a visit to one of the highest, windiest and most sheer-sided points along the southern Oregon coast. Cape Sebastian State Scenic Corridor, a wooded promontory offering spectacular vistas and over 80 miles of shoreline from Humbug Mountain, OR to the tip of northern California, is one of Southern Oregon's natural treasures. Take a forest hike or a natural trail down to the beach where you can fish or wildlife watch. Photograph the abundant land and sea wildlife that's around every corner. and stake your spot on the beach to watch the huge gray whales migrate south for the winter or north for the summer. Open year round and easily accessible right off US Route 101, isn't it time for you to put a visit to Cape Sebastian on your travel bucket list? Please call 541-469-2021 for Events Calendar. Where can I swim at Cape Sebastian? A Many beaches within Oregon State Parks are open to unsupervised swimming and surfing. You are responsible for your own safety. Please swim with a buddy and be aware of the weather, wind and ocean riptides. Is hunting allowed near Cape Sebastian? A While Cape Sebastian is mainly known for its fishing and wildlife watching experiences, some areas of the state park do allow hunting. For specific information about hunting near Cape Sebastian, please contact the Oregon Department of Fish & Wildlife (ODFW) at 503-947-6022.